mid-first century A.D., is a satirically witty, bawdy, wild ride of a tale. poetry and prose, reconstructing the genres and fashioning a new and distinct category of prose fiction. 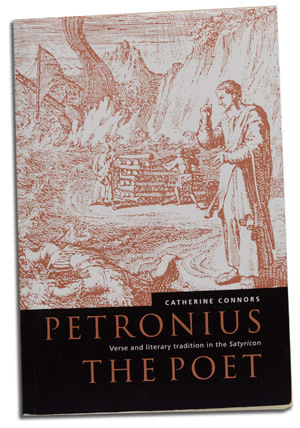 In Petronius the Poet: Verse and Literary Tradition in the Satryicon, Professor Catherine Connors describes each of the novel’s intricate twists and turns, explaining how Petronius drew from epic poetry, history, oratory and ancient tales to concoct his brilliant and unsparing parody. Professor Connors examines how the poetic structures function within this unprecedented format and provides a valuable insight into what is an extremely complex text. additionally alter the physical book itself through various manipulations. The emphasis here is often on how the particular structure and unique visual presentation of a book is integrated with the text to make the reading an entirely revamped experience.